Contact me today to schedule your charter! My life has been completely blessed with high points that made me squeal with glee and low points that guided me to learn to appreciate love and beauty. My newest discovery is a culinary master and adventure travel package that came wrapped together. I found “Envision Charters,” which has a 42-foot catamaran — the Tunnel Vision” — that is not only taking people out of Avila Beach on sunset cruises and other exciting sailing adventures, but I arranged for a new chef to come on board and prepare an inspiring meal that was as beautiful as the sun setting on the sea. With six passengers, a captain and a culinary crew of three, we set out into the sunset and the ocean rocked us into Heaven. On board, the size of the galley (kitchen) resembled a space only Keebler elves could navigate. Chef and crew prevailed bringing up the spectacular bounty in 20-minute increments, which served the sailing, tacking and whale watching well. Chef Marcos Giovanni is a master in flavors and panache having foraged all of his ingredients from Saturday morning farmer’s markets and surrounding businesses. We started with a cheese plate and Charcutierie with Truffled Brie, a 5-year-Gouda, a nd a Point Reyes blue with fresh honey poured over the mound of savory cheeses. This was paired with crusty Italian bread (from Éclair Bakery) and sliced grilled chorizo (from Arroyo Grande Butcher Shop). The accouterments were Marconi almonds, macadamia nuts, fresh raspberries and blackberries. We snacked as Captain Nick (Del Giorgio, also the boat and business owner) raised the sails and opened a bottle of Cristal Champagne to toast the adventure and the food to come. The next dish was raw oysters on the half shell. These living delights were purchased from BJ’s Fresh Seafood on the Harford Pier. Rinsed in Champagne, and with a dab of horseradish, key limejuice and a spot of Tabasco. We ate six dozen in less than 10 minutes. A Caprese salad with garden fresh heirloom tomatoes and basil from farmer’s market was our next entrée. We enjoyed the brilliance of this dish inspired by our chef’s grandma. Distinctive mozzarella with a touch of Robbins Family Farm balsamic vinegar bought from Verena’s Go Gourmet rounded out this remarkable snack. 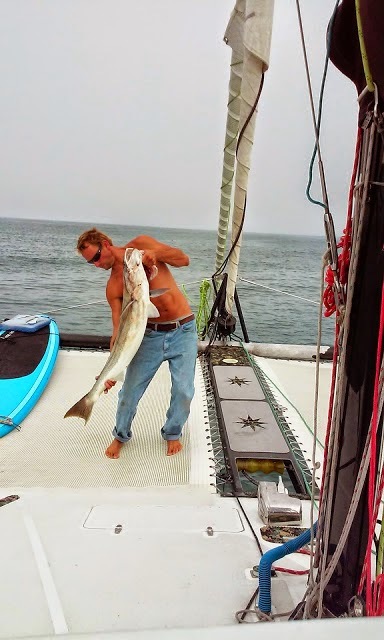 The filet kabobs were added to the grill that hung over the side of the boat and gave the chef some time in the salty air, and sailors a chance to chat with him. Cubed grass-fed filet, with organic green, red, and yellow peppers, yellow sweet onion, and mushroom, they were lightly herbed with Provençal and Robbin’s Extra Virgin Olive Oil. He prepared his next passionate offering of swordfish steaks while telling us tales of cooking in Italy. Our next course was one of the best things I have ever have put in my mouth. A platter of seared Ahi that was peppered and seared then topped with baked strawberries in a balsamic vinegar reduction sauce and sprinkled with crumbled Gorgonzola. The saltiness of the fish, the sweetness of the sauce and the savories of the cheese, made this a culinary delight. Then we had apple wood smoked bacon with a ribbon of Sirracha sauce wrapped on asparagus tips. They were cooked on the grill as the sun set and the main dish was prepared. We switched to a bottle of Barton Family Wine E Street, a Tempranillo blend that stood up to the food’s strong flavors. 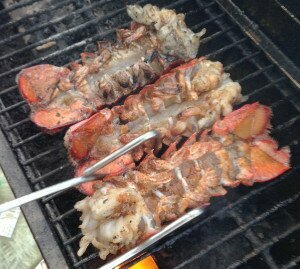 Our live main lobster was cut in half, filled with EVOO and herbs, and then grilled face down. We ate the lobster meat on the deck using the shells as our dishes. It was delectable. Dessert came from Sweet Pea Bakery, a chocolate infused cookie that was a perfect finish to this meal. Captain Nick told us tales of the high seas; let us all take turn “steering” the boat and learning to read the wind. We all laid back on the front trampolines as we sailed home feeling the salt of the sea on our backs and the warm wind in our faces. As the sound track to “Chef” played over the speakers, we all assessed our current state of heaven. Our bellies full of delectable delights and the rocking of Mother Ocean. Boy, I love this job! 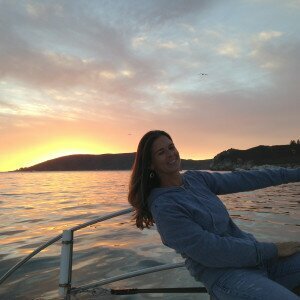 To book a charter or learn more about sailing, see:http://envisioncharters.blogspot.com. Teri Bayus can be reached at: livewell@teribayus.com or follow her writings and ramblings at: www.teribayus.com. 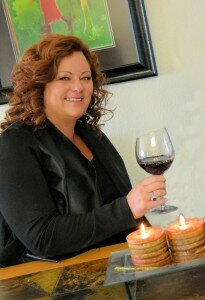 Bayus is also the host of “Taste Buds,” a moving picture rendition of her reviews shown on Charter Channel 10. Dinner and a Movie is a regular feature of Tolosa Press.com. Envision Charters is based out of Newport Beach and Avila Beach, California. The Charters are operated and ran by Captain Nick on a 42' Sailing Catamaran, "Tunnel Vision". Nick is the owner and Captain of Tunnel Vision, the 42' Hughes Cruising Catamaran of Envision Charters. He is a United States Coast Guard Certified Captain, with a sailing and towing endorsement. He is certified in CPR and First Aid, and has an outstanding sailing and safety record and knowledge of the sea. He has been an experienced sailor for over 25 years.